The Missouri College Advising Corps (MCAC) recruits, trains and places recent graduates from any undergraduate institution to serve as full-time college advisers in Missouri high schools that have high percentages of low-income, underrepresented and first-generation-college students at risk of not going to college. Advisers are often from backgrounds and schools similar to the high school students they are serving. They guide students – and their families – through college planning, preparation, application and financial aid processes. Advisers help students find their “best fit” post-secondary option – whether technical, two-year, four-year, public or private – and they help provide students with the knowledge and tools to persist and graduate from college. MCAC is one of 25 partner programs in 14 states with the National College Advising Corps – and one of 10 inaugural members. 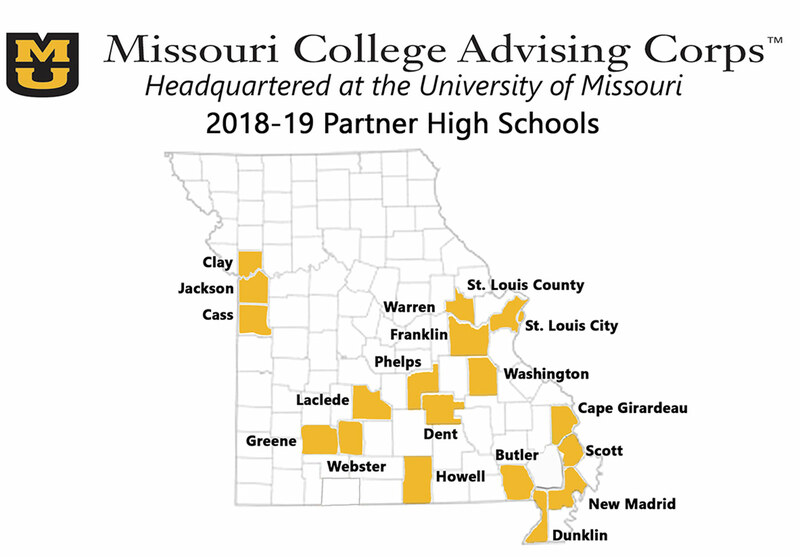 In 2008, MCAC placed its first college advisers in seven high schools. Now in its 11th year, MCAC serves 48 partner schools throughout Missouri. The mission of MCAC is to increase college enrollment for students, particularly first-generation college, low-income, and those underrepresented in college thereby increasing their chances of a better economic future. As full-time AmeriCorps members, MCAC advisers serve a minimum of 1,700 hours each year directly working with students to access and prepare for post-secondary success. For this service, each adviser is tasked with completing a set of 15 different deliverables – specific tasks premised on what research demonstrates encourages students, particularly first-generation students, to enroll and succeed in college. These data-driven deliverables include one-on-one advising with all seniors and juniors; facilitating campus tours; implementing a variety of workshops designed to educate and assist with college applications, financial aid, test preparation, etc. ; as well as other activities designed to promote a college-going culture at each school. Download a transcript of this infographic (TXT).